Have you seen this giraffe? 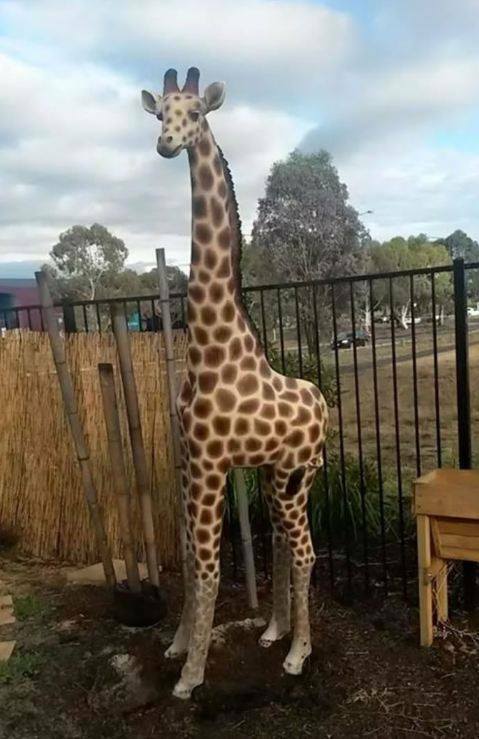 It may sound like a tall tale, but police are investigating the theft of Stretch, a six-foot fibreglass giraffe statue from Gungahlin over the long weekend. The statue was stolen from Kinder Haven Childcare and Early Education Centre sometime between Thursday 2 April and Tuesday 7 April. If you know Stretch’s whereabouts, contact Crime Stoppers on 1800 333 000 or via www.act.crimestoppers.com.au. In all likelehood, it is probably being used as a bong right now in a townhouse somewhere. Failing that I would start checking social media immediately. What thieving prankster could possibly resist taking photos of themselves with a 6 foot tall fibreglass giraffe? Oh Oh ! I thought i saw some thing similar at the canberra zoo !